Choose from one of our caskets or urns offering you the opportunity to keep the ashes at home, inter them or scatter in a favourite place. Our brass urn is engraved with champagne coloured paw prints on the lid and has a sleek pewter style finish. 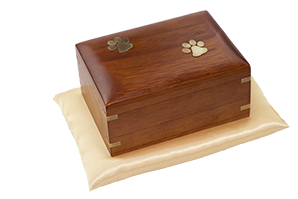 The Elstree is a hand crafted wooden casket, which boasts a rosewood finish and brass effect inlaid paw prints and edge detail. 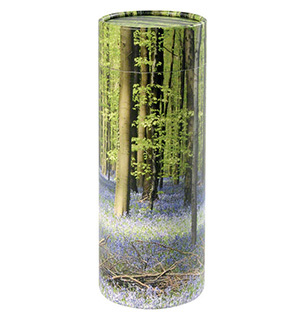 The Evergreen Scatter Box comes with a contemporary styled biodegradable tube, ideal for you to inter or scatter the ashes of your companion. Classically styled, this durable solid oak casket is decorated with carved, rounded edges and is supplied with an engraved nameplate. 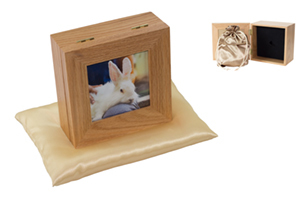 This beautiful solid oak casket gives you the ability to place a photograph in its framed lid. The ashes are kept inside a satin bag. 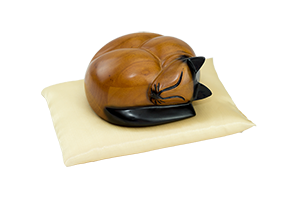 Our Sleeping Cat Casket is a poignant choice for our feline friends. 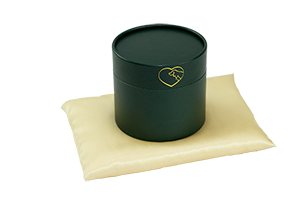 Caskets and urns in the Signature and Evergreen collection come beautifully presented in a green presentation box nested in satin for extra protection. 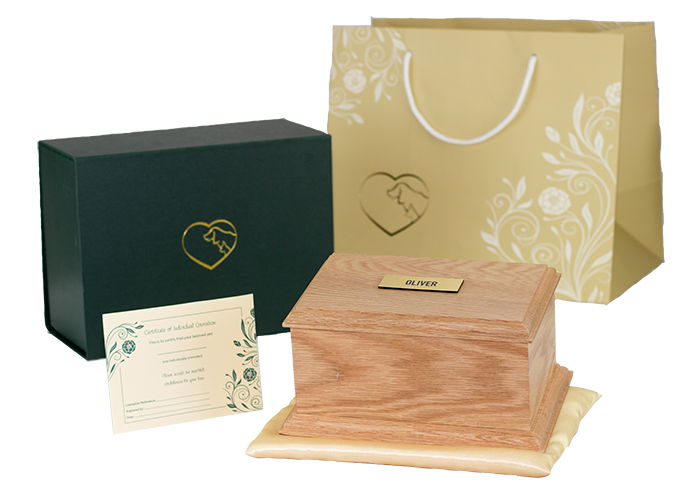 All caskets and urns come with a certificate confirming individual cremation. 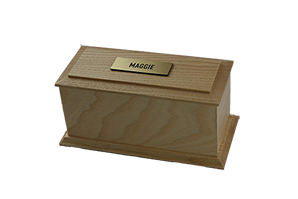 This natural wood casket has simple edging and is supplied with an engraved nameplate. The Scattering Tube is a simple, biodegradable container which will hold the ashes of your pet until scattering. 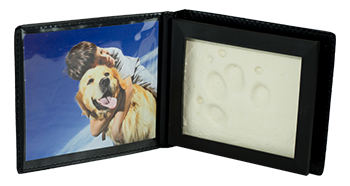 Our Paw Print Picture Wallet bound in a leather effect cover is a lovely keepsake to complement a casket or urn. 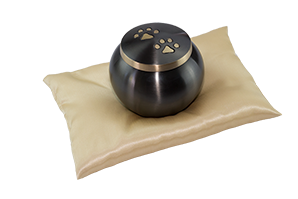 It allows a space for a picture of your beloved companion and an imprint of their paw print. 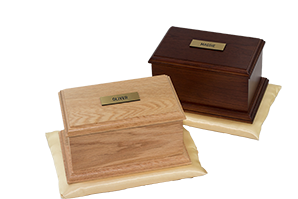 We are here to help you select the right casket or urn for your pet’s ashes. Please contact us for advice. Every effort is taken to show the exact product at the time of publication. Product images shown are for illustration purposes only and products may vary in style, colour, texture or material. The crematorium reserves the right to change product specifications and product descriptions at any time without notice.